Eating healthily is hard. It’s even harder when you’re on a budget. I’m not embarrassed to say that we’ve had less than £100 a week this month which has to cover food shopping, petrol and things to do on the weekend. Let me tell you that it doesn’t stretch very far! Despite this, I’m determined to maintain some form of balanced diet, not just for the boys but for us as well. 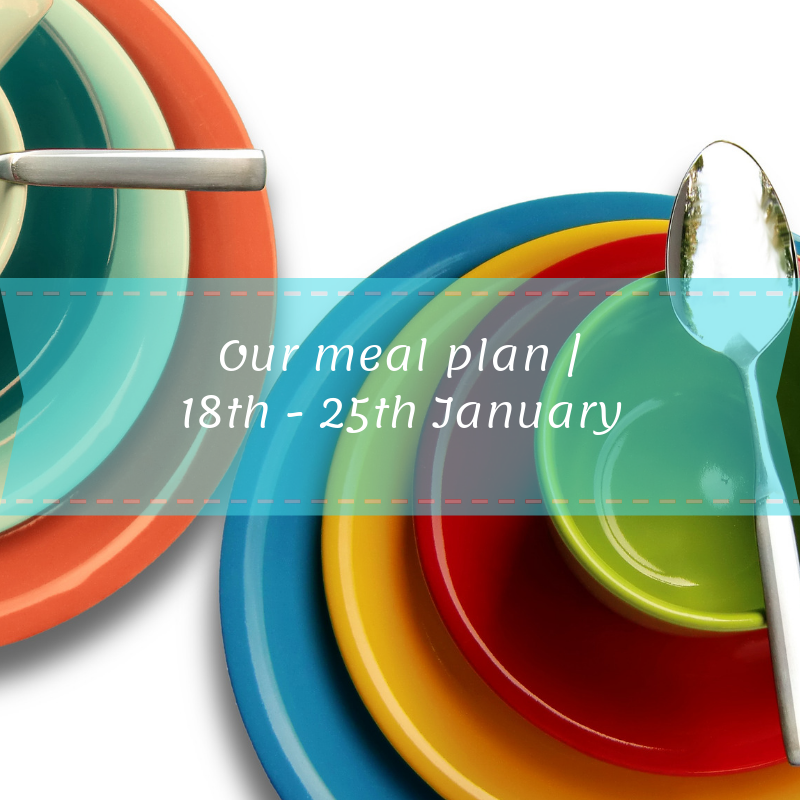 So I thought I’d share what’s on our meal plan for this week to hopefully give you some inspiration if you’re stuck in a food rut. I used to assign a meal to each night but we’re far too picky to stick to it! Instead, I keep a note on my phone of the meals I’ve planned and I’ll just send it to Gareth if I don’t know what I fancy. I try to mix it up and do meals I know the boys like as well as new foods so they can expand their taste buds. They don’t usually eat the new meals but I refuse to cook a different meal for them; I don’t have the money or the patience! This is a firm favourite here. I always make an extra large one so there’s enough for seconds or even thirds. I do buy the packet mix, mainly to keep life easy for myself. Again, a meal which I know will go down well. If I’m buying a bag of potatoes, I’ll make sure to add another meal which needs them so they don’t start sprouting in the back of the cupboard. We’ll have this with stuffing which we’ve already got, Yorkshire puddings, veg and gravy. This is one I’ve thrown together from my cooking knowledge. We had some spaghetti left over from last week so I’ll boil that and then toss it in crème fraiche and pesto. Sprinkle over some dried chilli flakes and lemon juice and I’m hoping it’ll be delicious. There’s also some garlic bread in the freezer which will be great for mopping up the sauce. Gareth loves blue cheese but it’s not my favourite so he doesn’t have it often. I saw the recipe for this in the free Tesco food magazine and it sounded quite nice. We also had half a bag or Arborio rice in the cupboard so it was a great recipe to use that up. I didn’t want to blue cheese to go off in the fridge so when I found this recipe in the Sainsbury’s food magazine, it sounded perfect. The original recipe asks for smoky bacon rashers but I’ve substituted that for Quorn bacon. Hopefully, everyone likes it. This is a recipe from Today We Cooked (if you’re not following her on Instagram, you need to). She creates some amazing vegetarian meals which give me so much inspiration. Taken from Jamie Oliver’s 5 Ingredients book, these recipes are great if you’re on a budget. I mentioned this book in a budgeting blog post I wrote last year. They don’t cost loads and they always taste delicious. We’ve never made this one before but the ones we have made, we’ve all loved. For lunches, I bought two pots of sandwich filler as well as some garlic and herb cream cheese for pasta. I also thought that pesto pasta would be good too. There’s also Pot Noodles and Minion pasta shapes if the boys fancy those. Breakfasts are Gareth’s domain and I didn’t actually buy anything this week. There’s some bread and cereal but I wish I’d bought some crumpets or something. They’re only 50p in Tesco so I might get some anyway. On Saturday’s, Gareth gets a lie in and I make pancakes so at least that’s one breakfast taken care of. There we go. I hope that’s given you some inspiration, I often find myself in a food rut and I love seeing other people’s meal plan/food hauls. Let me know if you’d like me to make this a weekly feature and if you make anything that’s on here, I’d love to see a picture! Previous: Previous post: Need a freelance writer? Next: Next post: What did I think of “You”?